Other Donation Programs - Farmers and Hunters Feeding the Hungry - Hunt Down Hunger! The following links will take you to the websites of other venison donation programs that assist hunters with donating deer to help feed the hungry of their communities. Most are separate, independent organizations with their own policies and procedures which may differ from those of Farmers and Hunters Feeding the Hungry. 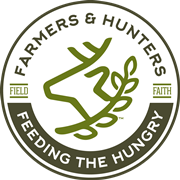 This listing is provided for informational purposes as a resource to hunters and farmers interested in feeding the hungry in states or locations that are not currently served by our FHFH ministry.